I have felt a little lost when it comes to book selection this summer. 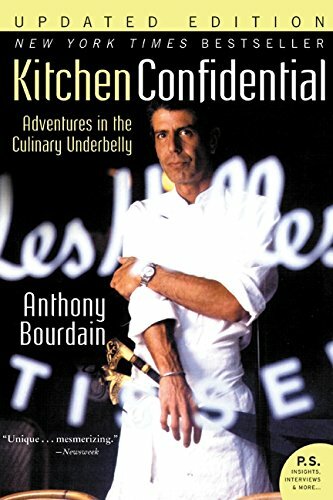 When watching an episode of Anthony Bourdain: Parts Unknown a few weeks ago, I remembered I have never read his book Kitchen Confidential. I loved Bourdain’s book Medium Raw: A Bloody Valentine to the World of Food and the People Who Cook. He won me over with the over-the-top adventurous foodie story of dining on Ortolan, a rare small bird illegal to eat in most countries. His description of himself and a group of other world-renowned chefs eating the Ortolan, which are traditionally consumed whole, beak and all, took my breath away. If you think I wouldn’t try Ortolan if given the chance, you apparently have never seen me eat freshly harvested Rocky Mountain oysters cooked on the branding iron fire. These tales of the restaurant industry makes me so glad I have never worked in that field. It also makes me realize why so many chefs develop drug and alcohol problems. Bourdain writes that he has stayed in the rough and exhausting industry because he loves everything about food. I do, too, but I prefer to experience it as a diner and a terrible cook. This is an interesting read and might just make you be thankful for the career field you chose, whatever that might be.